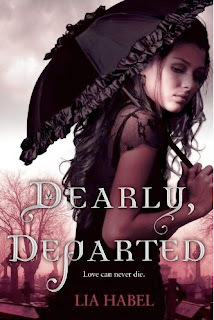 Dearly, Departed is one of the most enjoyable steampunk novels I’ve ever read, as the author skillfully puts Victorian customs down in a futuristic setting and then throws the crazy addition of zombies into the mix! It is, unfortunately, also a very frustrating novel in many ways, mainly because it has major flaws that stand in the way of a really terrific story. In the year 2195, Nora Dearly is just coming out of a period of mourning for her father, who was a noted scientist, when her home is attacked by living corpses. She’s rescued by Captain Bram Griswold, a dashing young man who turns out to be not quite alive himself. There’s a difference between Bram’s brand of zombie, however, who have technically died but have retained their memories and personality, and those who are just mindless, violent cannibals. There are a number of well-plotted action sequences, mostly involving escaping from the bad, flesh-eating zombies called Greys–there’s a particularly fantastic one involving a parasol being jammed into a, ahem, vulnerable part of an attacker’s face. I liked the explanations as to why the zombies crave fluids and proteins (their bodies are drying out and their own body tissues don’t rebuild on their own), as well as the fact that the author thought through the sicknesses and the “cures.” I also appreciated that there were attempts to explain why Victorian attitudes and customs were adopted again after hundreds of years, as in the rebuilding period after catastrophic world events, Nora’s ancestors viewed that era as a model of civil behavior, order, and prosperity. While you have to accept a certain amount of implausibility when you read any steampunk novel (okay, and any zombie novel, too), most of them don’t even try explore why the world might be the way it is. I’m also prone to get a little fussed over Victorian novels that have a faulty ear for the language–but somehow the author manages to combine surprisingly funny, modern dialogue with more formal speech and mannerisms in a convincing and winning way. …I found little bottles of shampoo and soap and a toothbrush and the like, as well as a tiny brown glass vial of perfumed oil. It smelled of violets and chocolate. Yeah, like I needed the zombies to find me any more delicious. That’d be like a cow wearing eau de gravy. The parts of the book that were good were really entertaining, however, so I’d say that if you’re interested in steampunk, it’s definitely worth a read if you can borrow a copy, as long as you keep your expectations in check. I’m hoping that the next installment of this series will find a much more streamlined story that won’t alienate readers with a distracting and unnecessary framework–because this is an author with a lot of fantastic ideas who deserves an audience. Fingers crossed that Dearly, Beloved (Dearly #2) will be everything that Dearly, Departed almost achieved. I still really enjoyed the story despite its flaws, so I hope you all will, too. :) Thanks for visiting! thanks for the honest review! it looks like it might be a fun read in spite of all the character pov’s. Oh my gosh, I’m so excited to read this one! I just got my hands on a copy too and I can’t wait to start it! Awesome review, Wendy! :) I hope book number two hits the bulls-eye with you!